To fill the walls, wire netting is cut to size and is stapled to the studs. 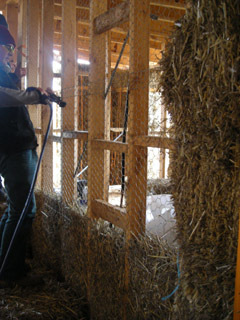 Loose straw is then stuffed into the 'cavity' until the wall is firmly full with straw. The stuffing is done in levels so that the walls can be firmly compacted before moving up. Progress is slowed down somewhat by the fact that wall noggings must be worked around. Eventhough the process is time consuming the end result is high levels of insulation, both for heat/cold as well as noise, inside the house, as well as the existing high R-Value of the external walls.